Poor Lucy. 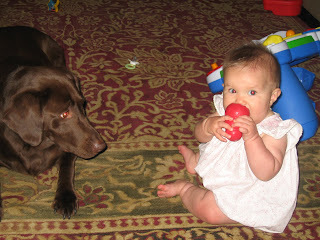 Lucy has always only had one toy, her KONG. Because we only gave her this one toy, I believe is why we have never had problems with her eating our furniture or wanting to shred things. 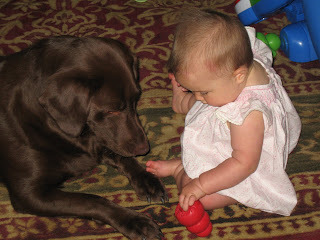 Now Kate on the other hand has lots of toys and doesn't know that Lucy's KONG is not one of them. 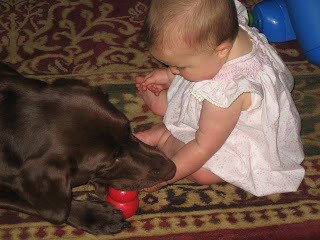 The KONG is actually becoming one of Kate's favorite toys now. She can spot it from across the room and she will crawl her little heart out after it. 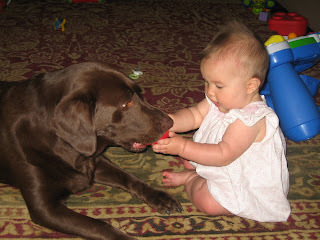 Below is the usual interaction between Lucy and Kate concerning the KONG. The only good thing about this is that when Kate takes the KONG from Lucy she doesn't mind and then Lucy will take the KONG right back from Kate and Kate doesn't mind. At least they know how to share! 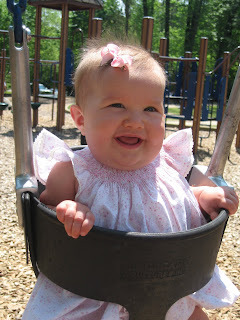 We went to the park again today and just wanted to include this sweet picture of Kate enjoying the swings. 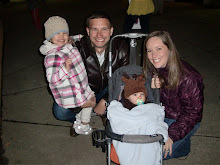 Bryce must have really missed Kate when we left Atlanta last weekend because this weekend he came to Birmingham to visit! 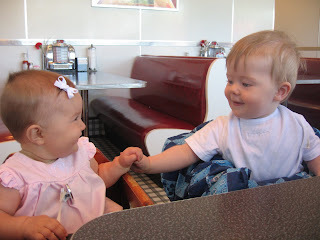 Hopefully they will grow up to be best of buddies. After lunch we all headed to the park. Kate LOVES the swing. 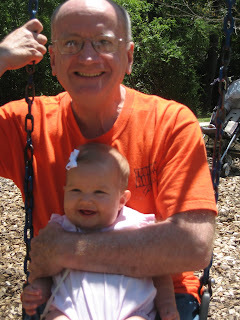 Here she is with Pop. 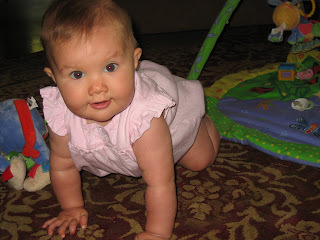 Kate has not tried to crawl over anything yet..well, until now. 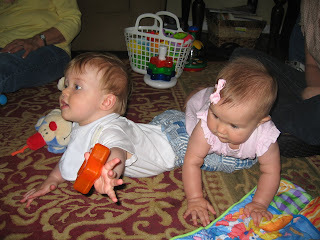 Bryce was happy to provide assistance as Kate tried to maneuver over him to a toy. This picture was actually taken a few weeks ago but my friend Lisbeth emailed it to me and I just had to post it. 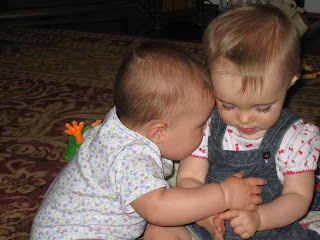 Isn't this the sweetest picture of Kate and Anna Beth?! Thanks to Marianna you're about to know some useless information about me! I was a high school junior at Shades Valley HS. Go Mounties! I love fruit snacks - I could eat a whole box in one sitting! Yikes...this will show my heart. Here are the first things I thought about. One more post about our trip to Atlanta last week. We went to this fun place with all these inflatable toys/games/slides. They have a room for children 2 and under which is where we played. 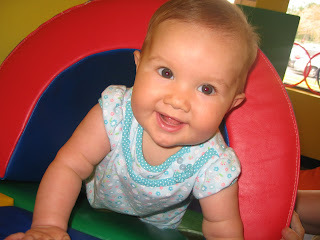 Kate wasn't crawling yet but she had a great time watching everyone else move around on all the fun mats and toys. And the best part is that it is free for children 11 months and younger!! I do have to tell this one story. Amy told me that there was this really fun slide in the back of the place. So we take Bryce and Kate into the room with all the big inflatables and go to this slide. After I manuever through a tunnel, around punching bags, up and down through horizontal poles and up the steepest incline to the top of the slide I politely asked Amy if she had lost her mind (well I may have said it a little differently). All this while holding an 8 month old and in socks and on a big blow up toy where you can hardly keep your balance all by yourself. That is what we should have been taking video of because I can promise you it was quite comical. Like I have posted before, Kate has been rolling everywhere, scooting, and is a pro at going backwards but has not made any forward movement yet - that is until today. Jason and I were playing with her and when we put her down on the ground this afternoon she leaned forward got on her hands and knees and crawled about 3-4 steps and grabbed one of her toys. We were both looking at each other like "did you see what I saw?" I got some video of her crawling a few steps, but we are still days away from full out crawling. She can get to her toys that are in the immediate proximity but she isn't all over our house by any means. 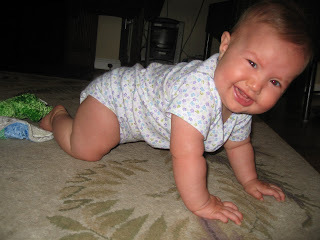 But how exciting that Kate is crawling!! Michael and Amy have a great place that just opened up down the road from them. There are two indoor pools and then this amazing outdoor pool, zero entry, playland area. We took Bryce and Kate to the indoor pool this afternoon and had a blast. Bryce is a pro in the water. He goes under easily, can hold onto the side of the pool by himself, and kicks, kicks, kicks in the water...did I mention Bryce is just 10 months old? This was Kate's first time in water besides the bathtub and she did great. She was great swimming like a frog on her belly and she didn't cry when we dunked her. 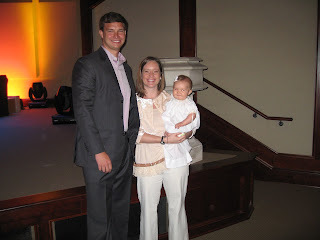 While Jason went to Augusta for the Masters, Kate and I stayed in Atlanta to play with cousin Bryce. We have had so much fun and have so much more to post about our trip but here is just some quick updates. 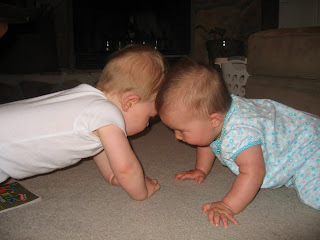 Bryce worked hard trying to teach Kate how to crawl. She is a pro at scooting and going backwards and she can even go from a crawling position back to a sitting position but NO forward movement quite yet...however we are really close! Here is where the title of this blog comes in. 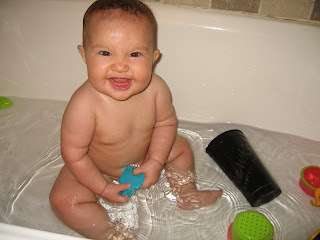 If you keep up with my sister-n-law Amy's blog then you know Bryce likes to poop in the tub. Well, we took the risk and put both kiddos in the tub tonight. 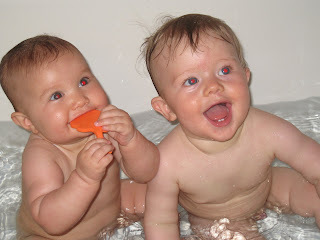 They had a blast playing and splashing and Bryce didn't poop! 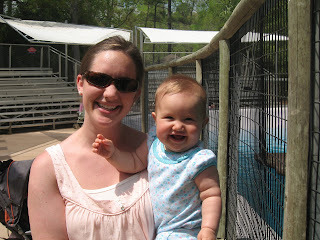 Today was a beautiful day and we went to the zoo with some friends. 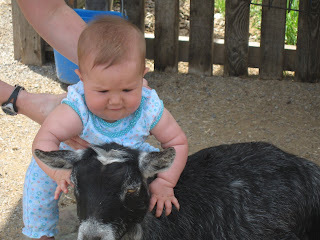 As you can see Kate loved the animals in the petting zoo...glad they are around kids all the time or they may not have like Kate pulling on their hair. 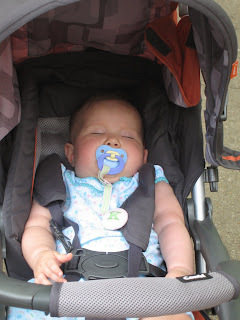 After the petting zoo Kate was sacked out for a little while and missed all the lions and tigers. But then she woke up just in time to see the seals and smile for the camera! This past summer I came home from running errands to find a box on my front porch that had been sent to us. When I opened it up I was beside myself with what all I found inside. My sweet friend Shea had made Kate all this stuff and sent it to me. She had made the cutest burp cloths I had ever seen and had filled the box with a million bows that she had made for Kate too. 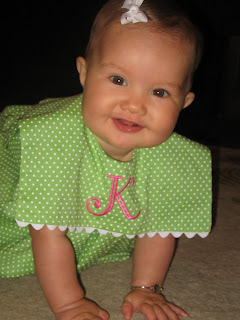 Below is a picture of Kate in the dress that she made...I have been patiently waiting for Kate to be big enough to wear it and finally today I put it on her to go to church (and by the way Shea, we had many compliments on it). So THANK YOU Shea! 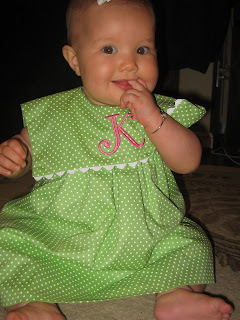 I may be learning to sew and can make Kate outfits now but your dresses are still cuter than mine. Let me update you on what has been happening with Kate this past week. Her first tooth finally broke through and you can feel it when you stick your finger in her mouth! We have started on big people food. Kate has been eating peas, carrots, bread, bananas, lima beans and grapes. Right now it is a painfully slow process to feed her this food but it is a lot cheaper to then buying baby food. Kate grew out of the bath seat we had so I just decided to try her in the big tub and she loves it! She can splash around a lot more and loves playing with her bath toys. We are SOOOOO close to crawling. However, as you can see Kate gets a little frustrated right now. 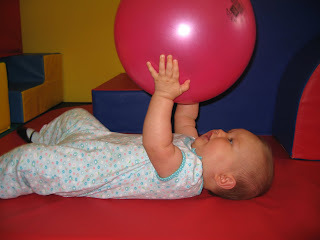 She can go backwards like a champ but is having a hard time figuring out forward movement. 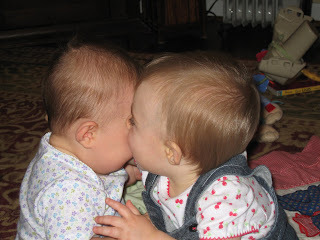 ...now Catelyn gets to eat Kate!! 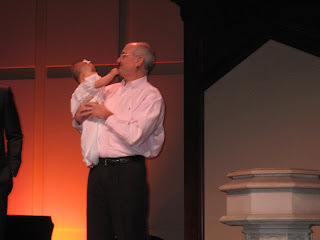 This past Sunday at church Kate was baptized. It was a little overwhelming as Jason and I stood up there and vowed to raise Kate and teach her about the love of the Savior. But I have to remember that it is God that draws his children to himself and that it is only he who can save. 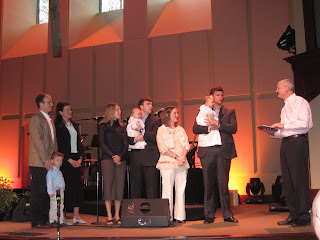 It was also a beautiful picture of the Christian Family as we were able to stand alongside two families that day that are also in our small group. So it really meant something when we promised to walk alongside other Christian parents as we raise our children together. All in all it was a great day!